I recently reached a huge milestone: a 1000-day streak on Duolingo. Yes, Duolingo has delightful illustrations and animations. It is completely free and doesn’t show TOO many ads. It covers all the bases- Theory, Reading, Writing, Speaking, and Listening. And best of all, it is super motivating. But for Intermediate language learners, it’s just not worth it. Do you visit Duolingo for a couple minutes a day to mindlessly tap through some exercises with words that you already know? Do you still not have the confidence to strike up a conversation with a French-speaking acquaintance? That was me. But not any more. I’m now dedicating my daily French practice to these: my favorite resources for intermediate to advanced language learners. I’m currently working through the six-week Coursera course, Étudier en France: French Intermediate course B1-B2. This course terrified me initially. They talk SO fast in the videos and all the other students seem way better than me- but I am working my way through it and I even got 95% on my first assignment! It’s no Duolingo, meaning you can’t get through this Coursera course solely on 3 distracted minutes a day while waiting in line for a coffee, but the app is decent and the work is quite bite-sized, including short videos, reasonable reading assignments, and 150-word writing assignments. My only complaint about Coursera is that this is the only French language course on the site, so after these six weeks, I’ll be moving on. Kwiziq French is great. Like Duolingo, it has short, bite-sized online exercises that help you learn little by little. Unlike Duolingo, it requires a bit of reading. Kwiziq gives you ten “topics” at a time to review, then a “Kwiz” to test your understanding of those topics. A0: Entry Level, A1: Beginner, A2: Lower Intermediate, B1: Intermediate, B2: Upper Intermediate, and C1: Advanced. Duolingo is focused on the A level, so Kwiziq can take you a lot further. So far, Kwiziq’s free plan of 10 kwizzes per month has been more than enough for me, but I’d consider paying for unlimited access because the content is very high quality. Just search for “French conversation” in your city on Meetup. Chances are, you’ll find a group of friendly, supportive language learners who meet regularly and welcome newcomers. Yes, it’s intimidating and hard, but it’s the quickest way to learn spoken French! Paul Taylor, Comme une Française , and more. There are a million YouTube channels, ranging from comedy in French to pronunciation for beginners. I won’t say much more than that. Dig around and see what you find! Yes, Netflix. Most shows and movies on Netflix offer French subtitles, so I am proud to say that my French wouldn’t be where it is today if it weren’t for Black Mirror. I haven’t watched any French language films or shows on Netflix but those are also great- with or without English subtitles! I know Netflix isn’t free but if you’re paying for Netflix anyway, then turning on French subtitles IS a convenient and free way to learn. I was lucky enough to take the Eurostar from London to Paris to celebrate my 29th birthday. On the train ride down, I devoted my attention not to the beautiful French countryside, but to the Metropolitan Magazine. I loved struggling through the French articles with the English right there beside it. I would get the gist of the article in French, then check the English to see if I got it right. WestJet and Air Canada also have bilingual magazines, so I always look forward to flying within Canada! Speaking of Canada, French learners can benefit from our two-official-languages policy by listening to French-language stations of the CBC, the Canadian Broadcasting Corporation. Sure, Spotify has lots of good French music, but I find that they have a lot of ads unless you pay for Premium. CBC’s Ici Musique has the same great French music, but without the ads. And, as an added bonus, they have news updates so you can get used to hearing spoken French. Learn French by Podcast is great because there’s LOTS of content. 195 episodes over 12 years. The earlier ones are a bit easier than the later ones, so it’s great to just binge on from the start. What I like about this podcast is that they have a short conversation (which I usually find hard to follow), then break down certain phrases, explaining what was said and why. They also encourage practicing pronunciation with lots of “repeat after me” exercises. Another nice thing about podcasts in general is that if they’re too hard you can slow down playback. Too easy? Speed it up! It’s not free, but I’m adding French kids’ books as an honorable mention. When I was in Thailand a year ago, I stumbled upon a used book store. They had a French section. I looked through some classic novels, longing to be able to read them. 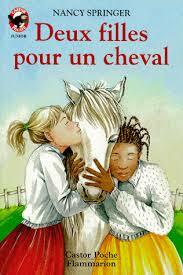 Then I found myself being drawn to a brightly colored, pint-sized book entitled Deux filles pour un cheval, or Two girls for one horse. I loved reading that book. I underlined words that I didn’t know, then looked them up later and wrote the definition in the margins of the pages. It was a great way to learn. Did I miss any great resources for Intermediate French learners? Leave me a comment! Appreciate the breakdown and resources, Shane. I would like to fully learn another language as well as encourage my kids to do the same.